My previous work as a professional engineer has allowed me to take that knowledge and experience and create a new career as an author of action adventure books that use an old car as the main character. I thought you might like to sample a brand new short story that I am using as a prequel to my published book “The Bootlegger 40 Ford.” I believe it will not only grab your interest but also tickle your imagination and demonstrate the authentic approach I use in my writing. Buckle your seat belt and get ready for this ride: It’s about a titanium car part, the man who invented it, and what happened to the car as a result of this ingenious invention. Thanks a lot, and hope your year is off to a rubber peeling start! 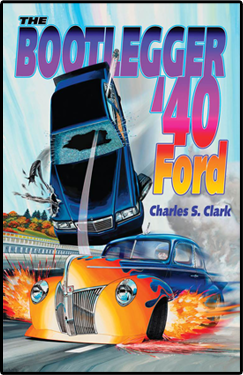 Last month, I favorably reviewed ‘The Bootlegger ’40 Ford‘ by this author. 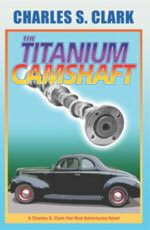 ‘Titanium Camshaft’ is the prequel to that book. This paperback is short (66 pages) and priced accordingly – less than three bucks from Amazon. Once again, the star of the book is a 1940 Ford standard coupe. The plot is about the quest to improve camshaft performance and strength on a hopped up flathead Ford V8. Most camshafts are like Ray Charles’ Lucky Ol’ Sun – they just roll around all day. Keep them true, keep them lubed, keep the revs reasonable and camshafts will outlast most engines. When the lobes wear, they can be filled and reground to get another 100,000 miles out of them. Racing camshafts encounter far higher stresses and the book reveals the consequences and one man’s solution. This short story is an interesting, easy read and a fun one for car guys.